My baby had me up to feed her at 3:15 a.m. I had only just gone to bed at midnight. After she was fed I couldn't get back to sleep! So I did what any quilter would do... I came down to my sewing room! I couldn't get this little house block out of my head so I had to make it. The sun is still struggling to come up here and we've had fresh snow overnight. The light is not the best but I wanted to get this post up before life gets crazy today. You can see so far I have the house with a Christmas tree in the window and a reindeer on the roof. I love my little Cotton + Steel door and step. I am using the technique taught in the book Scrap House Quilt by Katharine Guerrier. The publisher is offering my blog readers a discount code for this ebook in either the download or CD versions. To get a 10% discount type code: daydreamshouse in the box on the basket page then click Apply Coupon to get the discount. This code will expire after 7th December and cannot be combined with any other offer. I am so impressed with these ebooks. All ebooks I've bought thus far have only been PDF files of the paper books but these Vivebooks ebooks have embedded instructional videos in them. It's like having your own private class with the author! 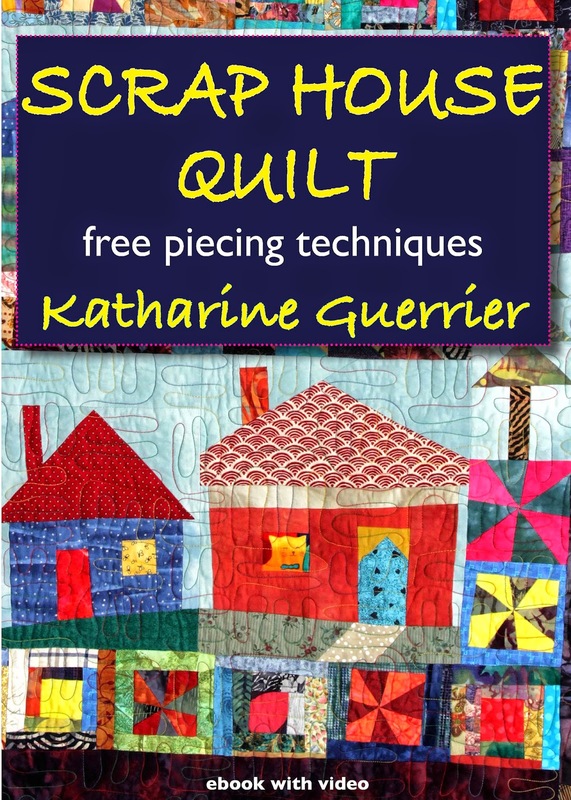 This book teaches you how to make the little scrap houses with surrounding gardens and trees and then how to tie them together into a quilt top using various quilt blocks such as HST blocks, Dutchman's puzzle blocks and so on. This is a fantastic way to use up scraps. I don't know about you but I am starting to get a bit overwhelmed with my scraps so I was happy see that this technique is a solution to that problem. These quilts are so cute for little kids too! You can use different novelty prints like the cat in the red house above to put cute things in the windows. A closer shot to show the little Christmas tree in the window. I am going to add a snowy front garden and a tree to my house block and the tree will be decorated with buttons for ornaments. This will become a throw pillow for a Christmas gift for one of my Aunt's and Uncles. I was feeling a bit lazy at 5:00 a.m. (I wonder why?) and I didn't sew in a chimney. I may still applique one on. I haven't decided yet. I will be sure to post the finished project for you to see but I wanted to get this post up for anyone else who wants to make Christmassy houses and take advantage of the discount code. You can order Scrap House Quilt anytime. The discount code for my blog readers is good until Dec. 7th. Disclosure: I received a free copy of the ebook in order to write my review. The links in this post are affiliate links. All opinions are my own and I was not influenced in anyway.